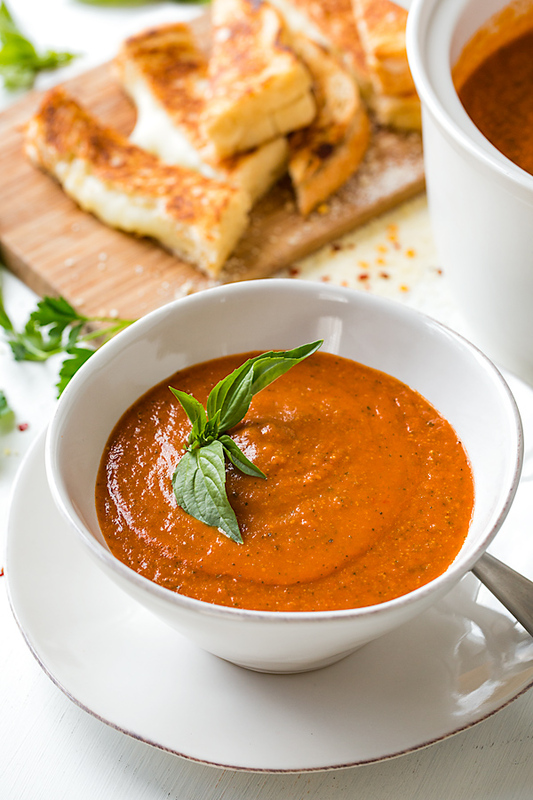 This rich and flavorful tomato basil soup, filled with bright basil, roasted Roma tomatoes, roasted garlic, and a hint of spice from red pepper flakes, is unlike any other tomato soup that you’ve tasted. And it may just become your new favorite. 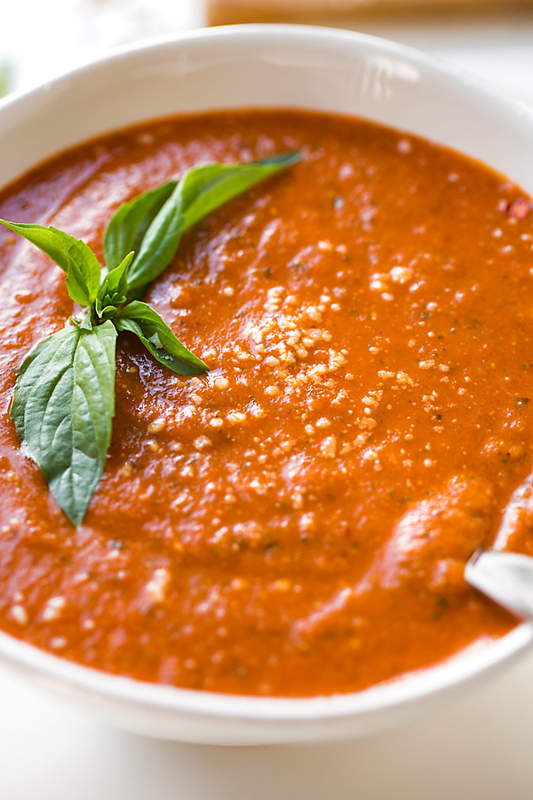 I love classic tomato soup with its rich, velvety texture and exquisite dip-ability. 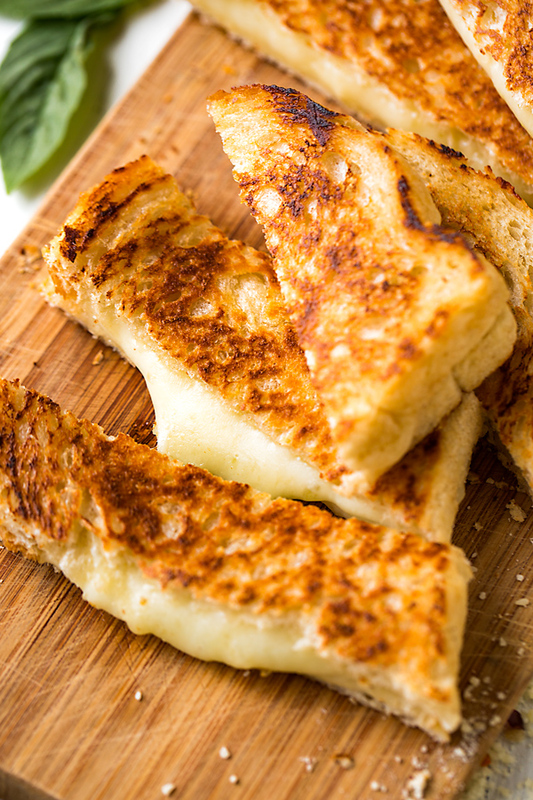 It’s always been the perfect accompaniment to another classic that I love so very much, the grilled cheese sandwich. The two make for a delicious pairing that soothes and comforts in the best way. Tomato soup is one of those fairly basic recipes; and on its own, doesn’t necessarily have a lot of “oomph” and complex flavor in its traditional preparation. But boy, oh boy, does it have the potential to be over-the-top, ridiculously good when you know the right bells and whistles to add into it. 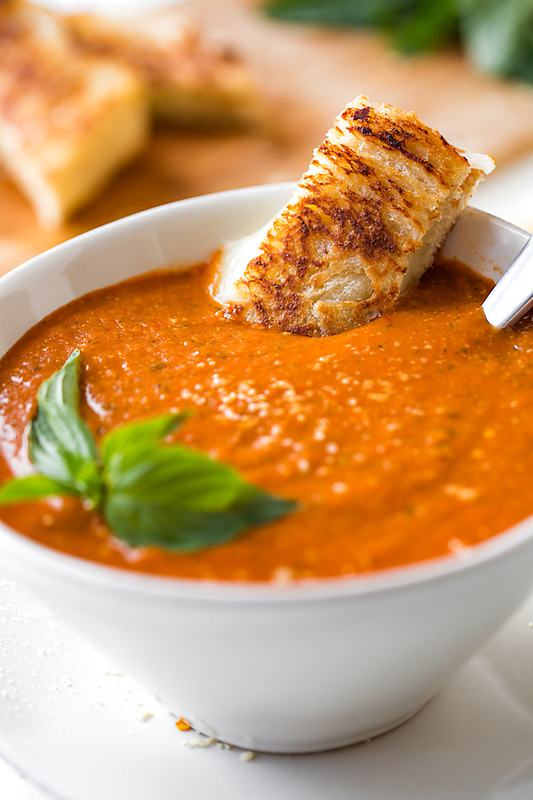 Enter this delicious tomato basil soup recipe, a fresh take on the classic. Tomatoes pair wonderfully with many ingredients, among those being fresh basil and garlic—especially roasted garlic. They also benefit from a bit of fiery spice as well, and mingle deliciously with red pepper flakes, which offer just enough heat to give a bit of tingle to the tongue and awaken the tastebuds. This is the reason that I personally prefer to use fresh tomatoes rather than canned when preparing my tomato basil soup—so much more flavor and depth! When fresh tomatoes are roasted, their natural sweetness comes out as well as their juiciness. 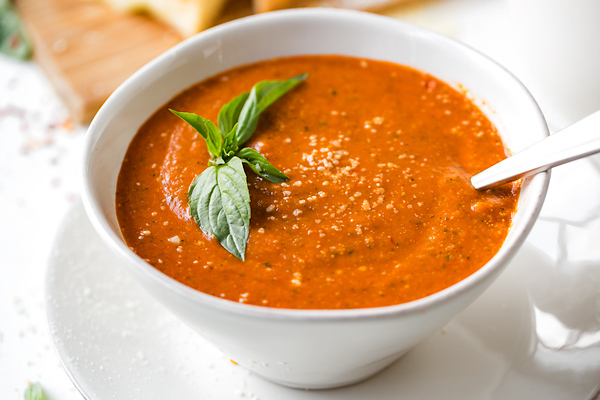 So using fresh Roma tomatoes roasted with a hint of balsamic, brown sugar and dried herbs as the base for this tomato basil soup, creates an extra level of flavor that is deeply comforting and soothing, and slightly more complex. Sure, roasting off the tomatoes and the garlic takes a little extra time and effort, but it absolutely makes a world of difference. 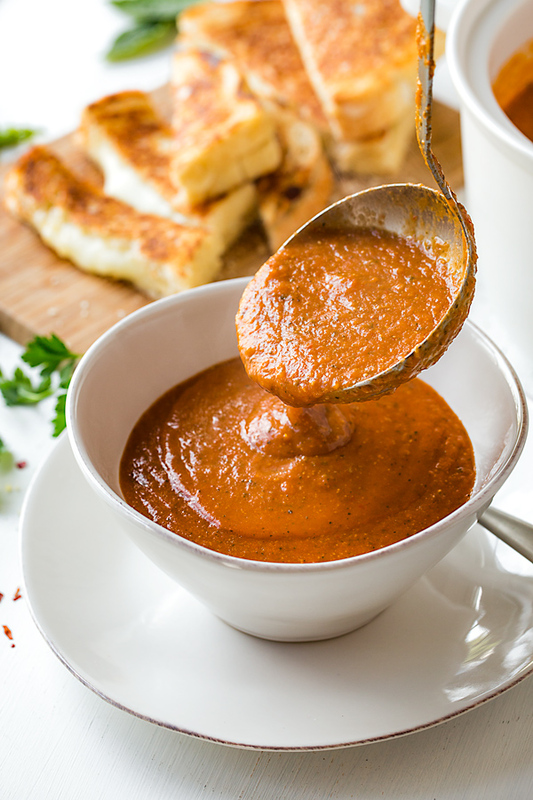 I have no doubt that the combination of flavors in this particular tomato basil soup recipe will make it one of your new all-time favorites! You and your loved ones will most certainly be able to taste the love in every hot spoonful, which is where all of that delectable coziness truly comes from, doesn’t it? Fresh Roma tomatoes: Using fresh tomatoes for this soup is key, and Roma tomatoes hold their shape and have a wonderful flavor that really comes out when roasted. Roast the garlic heads along side the tomatoes: To roast the garlic, simply prepare it and then place it next to your tomatoes on the baking sheet and roast them together. Croutons for added body: Croutons go great with tomato basil soup, and I like to add some in and blend them up to create a bit more body and texture. If you are gluten-free, simply substitute gluten-free croutons, or feel free to leave them out altogether. 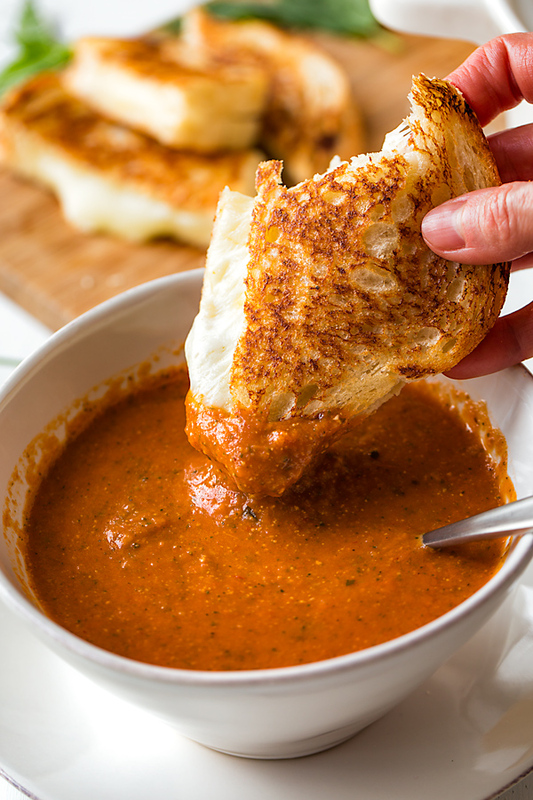 This tomato basil soup is a fresh twist on classic tomato soup, brimming with the earthy and savory flavors of roasted garlic and fresh basil, along with a bit of heat from red pepper flakes—perfect with grilled cheese or garlic toast!